Glow, get low and ignite some serious fire in your muscles at our black light fitness party! Join us for an exhilarating glow-light rock concert where everyone gets to be the star drummer! 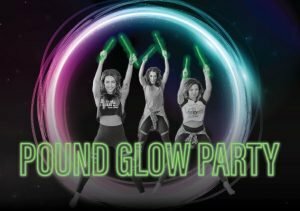 The Ripstix used for POUND Fitness classes just so happen to light up under black lights, so we’re amping it up at our Midtown studio with this extended workshop featuring 90 minutes of energizing drum fitness routines. Our amazing POUND pro duo, Lehla and Maureen, will take turns leading this full-body jam session, which uses simulated drumming with lightly weighted sticks to burn calories and tone muscle. Relieve stress and get a killer workout at the same time as you POUND along to great music. Expect a mix of cardio, Pilates, isometric poses, plyometrics and plenty of strength conditioning: squats, lunges, hip-raises, arm swings, squats, lunges, did we say squats yet?? We guarantee you’ll feel the impact of this party in all the best ways. No prior drumming or POUND experience required. Maureen and Lehla will break down the form and any tricky combinations so that everyone can unleash their inner rock stars. We’ll bring the sticks, mats, light refreshments (with neon plastic cups of course!) and maybe even some glow-in-the-dark accessories. All you need to do is show up ready to sweat. If you can, wear white or neon to add to the color fun! In addition to a great workout, participating in this event will help support a greater cause: a portion of each ticket sale will be donated to Everytown for Gun Safety. This initiative was spearheaded by one of our very own members, Rebecca Salus, who felt compelled to speak out about gun violence after the shooting at Marjory Stoneman Douglas High, her alma mater. After the workout, Rebecca, who is representing Mobilizing MSD Alumni, will give some brief information about the work Everytown does and her connection to the cause. Space is limited by the number of Ripstix, so please pre-register to reserve your spot! Saturday, April 28 from 6 p.m. to 7:30 p.m. Midtown studio, 1301 Locust Street, 2nd Floor. Tickets: $25, Members automatically get 20 percent off!! Wear: Athletic shoes and comfortable workout attire. White or neon colors will look especially awesome under the black lights!